Tree-adjunct grammar guided genetic programming (TAG3P)  is a grammar guided genetic programming system that uses context-free grammars along with tree-adjunct grammars as means to set language bias for the genetic programming system. In this paper, we show the experimental results of TAG3P on two problems: symbolic regression and trigonometric identity discovery. The results show that TAG3P works well on those problems. 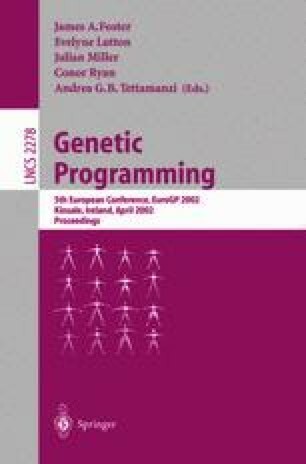 Ratle, A., Sebag, M.: Genetic Programming and Domain Knowledge: Beyond the Limitations of Grammar-Guided Machine Discovery. Ecole Polytechnique, France (2000). (Available at: http://www.researchindex.com. Accessed: 30, May, 2001).